This is my living room. It took me some time to get it where it is now but I'm thrilled with how it all came together! I always thought I would do a video tour first but I can still do that once it's truly complete,if your interested. It's very close to finished now, I say this because I think more couch pillows in all colors sizes and textures are always a great idea! Also, I'm in search for some bookshelves to use as an entertainment center. I'm hoping said bookshelves will have storage space cupboards or drawers in the bottom half, so as to keep all of the photo albums and books currently cluttering the underside of my coffee table and keeping them in one neat place. Other then some flowers, plants and little decor pieces it's now pretty complete in my mind. Ever since posting a picture of my living room in my Diy Fuzzy Stool Video, I have gotten a lot of questions about it. The first being, "are you a designer?" and "will you design my living room as well?" Ironically, I grew up with a great passion for home design and always thought I'd be an interior designer when I grew up. But nope, I'm not a home designer, just a lifestyle blogger with a great passion for home decoration. But yes, I would gladly help others select their pieces and help them decorate rooms in their homes, it would be my absolute pleasure! Most of the rest of the questions I've gotten were based mainly around where I found each item. Therefore, I thought now would be just the time to list for you exactly where I got each of these items with a little bit of background on the inspiration and thought process with selecting pieces and placing them. 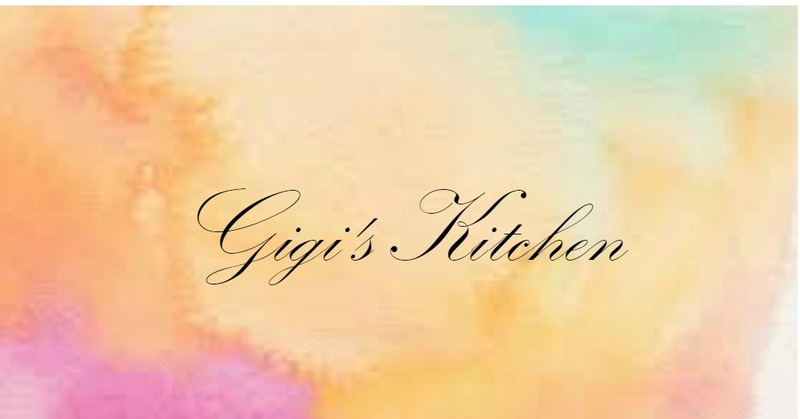 Next up is my dining room, kitchen floor and building a kitchen pantry + a bathroom remodel. I'm going to be keeping very busy! The living room started with with this navy velvet couch, I discovered it on Joss & Main one day while innocently scrolling and completely fell in love with it. It was one of those things I didn't even have to think about, I just knew I needed it. Then it went out of stock a couple of minutes later and I was downtrodden to say the least. A month later, I found it on a site called Goedekers. I had never heard of them so I was a bit weary but I did alot of research and read the reviews from their customers. It is entirely risky to purchase a couch online because you really don't know how it'll feel once you sit on it. There were very few reviews but everyone said it was comfortable so I went for it. And I'm glad I did because it is absolutely perfect. The delivery guys unpacked it and brought it into my house and did the heavy lifting to place it where I wanted it. While waiting for the couch to arrive I had already chosen this gray rug from Overstock. It is soft and plush which is nice when your running around the house without socks on and I love the darker and lighter swirls and grains that have it appearing like rustic wood. I selected both the coffee table and side table at West Elm and I knew that the gold and silver hardware with white and gray marble top would add to the modern feel I like to give my spaces, they were everything I imagined and more. When people come over they often ask me if the couch and arm chairs were a set. Maybe it's because I purchased them separately from overstock that I don't really feel they match but I'm happy they ended up going well together and being a close enough match after all. 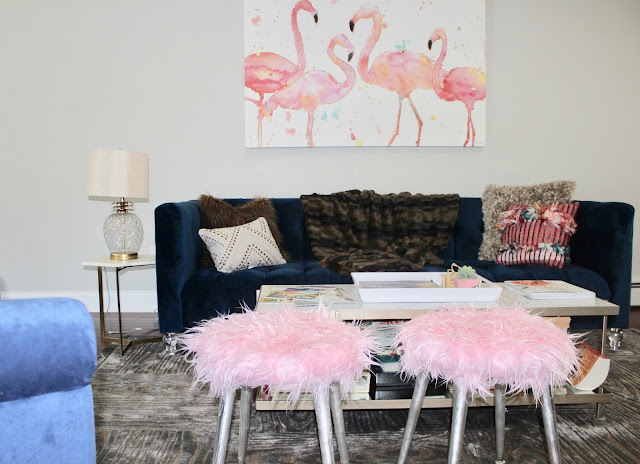 My favorite accent piece would really have to be that flamingo print canvas! As you may know, birds are some of my favorite animals- owls, peacocks, all of them. I love how the pink pops against the navy and that's what inspired my choice of that pink mongolian fur for my DIY stools. Another great find was the pineapple looking lamp I discovered at Pier 1, I love the gold details and clear base with a neutral shade. Once done selecting all of my bigger pieces it was time to select all of my smaller decorative pieces. I love pillows so I added plenty of them in all different sizes and textures but in complimentary colors. 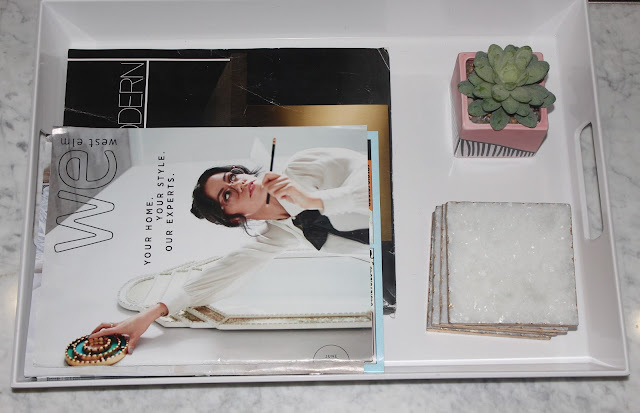 A small faux cactus succulent with a pink base and marble square drink coasters with gold trim were the perfect finishes to my new rectangular white tray along side my magazines and coffee table books. I also chose gray velvet curtains for the large window to the left side of the couch, put down a little navy mat in front of the door and got a gray mirrored entry table for the opposite side. I plan to share that whole side of the room in a separate post some time soon, so look out for that. Pink Fuzzy Stools- DIY project, watch my video detailing how I made them here. I really hope you enjoyed getting a peak at my living room re-design.